Black wins CIS Rapid in Central Park! One of the 600 participants in the Chess-in-the-Schools festivities. Chess has a way of creating happiness. We are officially amidst a chess renaissance in the U.S. With SuperNational scholastic tournaments drawing more than 5,000 players, St. Louis becoming the centrifugal force of growth of American chess (with St. Louis Chess Club, World Hall of Fame and Webster University) and increase in competitive tournaments, chess has never been more popular. During this current boom of scholastic chess, America has seen a resurgence with several home-grown players emerging amongst the world elite. CIS has been part of this successful surge. 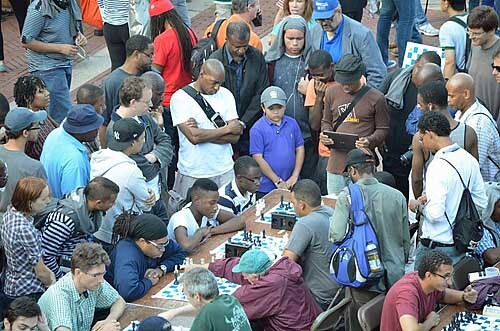 While St. Louis, Missouri may be the growth center of chess, New York can still be considered the capitol of chess activity. Chess-in-the-Schools (CIS) has been a successful institution for nearly 30 years and has assisted in this renaissance. 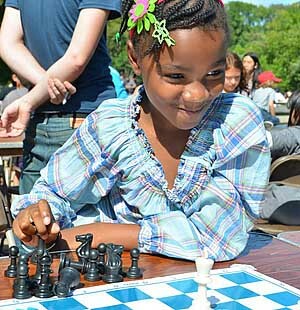 For the past 13 years, CIS has held the open-air chess festival featuring fun and games. Grandmasters are giving exhibitions with puzzles, prizes and the event is capped off with a 10-minute rapid chess tournament on September 21st. 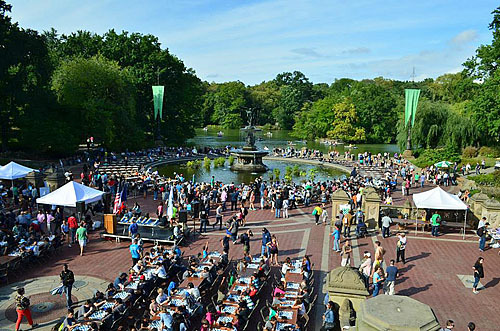 The event was organized by the Parks Department and CIS at Central Park near the Bethesda Fountain. Young scholastic star Josh Colas from White Plains was the two-time defending champion. Five-hundred boards were set up for a crush of players from around the New York area and a chance at local bragging rights. Battles of the top boards! It was a great tournament with over 600 players banging away in Central Park. The gentleman to the right of James (Lev Alburt) was the top seed. In the crucial round 5, James dispatched him in spectacular fashion. Going into the six round, it had seemed as if Josh was on his way for a 3-peat. Once again, he had to face his rival, Justus Williams. Josh had control of the game; it even felt as if Justus would be mated any seconds. Out of no where, Justus found one check that led to Joshua’s king being chased around and got mated. Now it was the final between James and Justus. It was the best out of 3. The first game ended in a scramble and James prevailed on time. 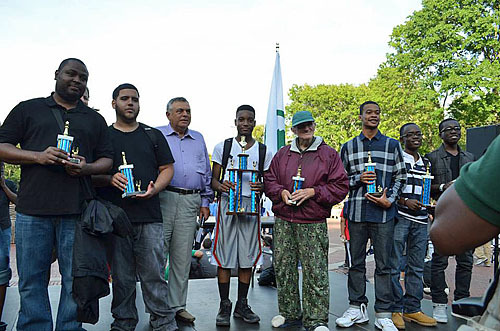 James won the second game and became the 2013 Chess-in-The -Park champ! It was great to see them (James, Justus, Josh) come in 1st, 2nd and 3rd. James Black, Jr. (center) took home the top prize! All photos courtesy of Chess-in-the-Schools (Facebook). Congratulations once again James Black Jr. !!!! I enjoyed watching you play all those strong players and coming out on top (undefeated). I had a brief conversation with Maurice Ashley at the Sinquefield Cup and I told him, “I just you and me again.” He told me keep charging on that in 2-3 years things will pick up. Most of the top Black players have either retired or passed on. From the old guard, only IM Emory Tate and FM William Morrison are somewhat active. FM Pete Rogers now plays poker. We’ve lost FM Morris Giles (car accident) and Ronnie Simpson (cancer) within the past year to. So James, Justus and Josh are the new breed. It was great that James and Josh got to play blitz with Ronnie Simpson. Look forward to seeing them compete for top honors in big tournaments. This is training ground and they will reap the benefits. This is the kind of story that needs to be picked by the media. Kids need something constructive to keep them busy, otherwise a lot of them will eventually end up in the 4 O’Clock news and then we start to fuss when it’s already way too late. Regrettably, one of the games that were fueled with so much anxiety is not posted. But in that game, you learn that in a game of chess, what seems most likely to happen isn’t always achievable and what seems like a jam could be untangled with an unwavering mind. It was a pretty game and the crowd enjoyed it! And to James black Jr., who has been out of the tournament circuit, Congrats!! I would like to say congratulations to James Black on his triumph in this event. I have been actively following the Chess careers of James, Josh, and Justus since their record breaking events as the youngest Afro-American Chess masters. I had the pleasure of meeting them at the 2012 U.S. Cadet Championship in Rockville, Md and was happy to see that one of them, in this case Justus Williams won the tournament in 2013. They all have been moving forces in the Chess arena and I congratulate them on their determination and success. I also commend Rochelle Ballantyne on her success. Chess is a game of mental aptitude, prowess, exercise, competition, focus and its benefits have been well documented. These young people are true role models for our kids today and tomorrow. We need to support them in mind, spirit and financially and I look forward to seeing them as grandmasters in the future. Good points, Greg. And congrats James Black . Don’t forget about Darrian Robinson! This was a game at Fulton Park between “Mr. Black” and “Joshukid”! It is nothing short of amazing that from such a huge field these three young “exemplars” made the “trifecta”! Congratulations and on to greater things! Indeed. 600 players on 500 chess boards and the Young Lions prevail. They are special players for sure. Congrats to FM Justus Williams. I just saw the title on his FIDE profile.